In France, or maybe in all Europe, Rene Furterer is a well-known name in the hair and beauty industry. 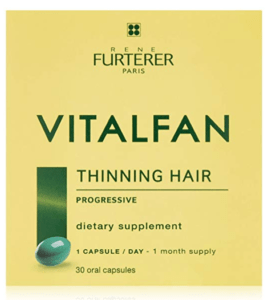 Today, this article, Rene Furterer Vitalfan Review 2018 will be looking at the hair vitamin supplement, its use, the ingredients, and the possibility of success for you and your hair. Let’s begin. Born in Provence, France – Rene’s love for hair led him places. He eventually started working as a hair stylist in his wife’s hair salon. As a child, he loved nature and experimented with the botanicals and was on a quest to have the beauty of hair and nature join forces. He believed that beautiful hair was a result of a healthy scalp. This treatment was custom-made (after a sophisticated preliminary diagnosis) for results using the botanicals of Mother Nature. Rene was the first to create a plant-based line of hair care products. He used rare and precious essential oils according to its nature and what they had to offer the senses. Rene continues to combine the best botanicals to treat all hair needs and his hair institute is located in Paris. He has received the award IMS Health in 2015 and has definitely built up a wonderful reputation for hair care. On the website, you can easily determine the type of hair loss/ thinning that you are going through. You see a decrease in your hair density over a period of 3 months or fewer, your hair is falling out a lot and you find it everywhere – this is reactive hair loss. You notice a slow, gradual decrease in hair density for more than 6 months, and you have thin, ‘skinny’ hair, coupled with a genetic history of hair loss, then you have progressive hair loss. The results can be seen from the very first course of hair treatment. It is suggested to take consistently for a 3-month period. 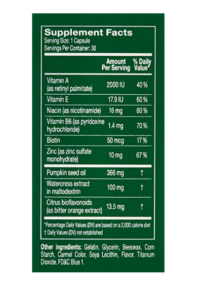 See the image for the dietary ingredients and percentage value. Bitter Orange (Citrus Aurantyium) – a native tropical plant which produces a bitter fruit. The extract stimulates micro-circulation on the scalp to maximize the supply of energy-booting and nourishing elements which help to fight hair loss. Blackcurrant Extract (Ribes Nigrum) – its origin is in Europe and grows in a mild climate. This botanical extract also stimulates micro-circulation as well as being a source of antioxidants. Lavender (Lavandula Hybrida) – used since Persian times as a bath oil due to its soothing properties. This extract has relaxing as well and antiseptic properties. Pfaffia, also known as Brazilian Ginseng – is native to Amazonia and is one of the most famous plants used in traditional medicine. It also stimulates scalp micro-circulation, thus maximizing the intake of essential nutrients for optimal hair growth. I am excited to say that I will be trying this hair supplement. Just based on the 4 main botanical extracts, I am impressed and I see where this supplement should do anyone’s hair a world of good. I will be updating the article as time progresses at the end of the 90-days period. If you have tried this supplement, be sure to leave your feedback as well. 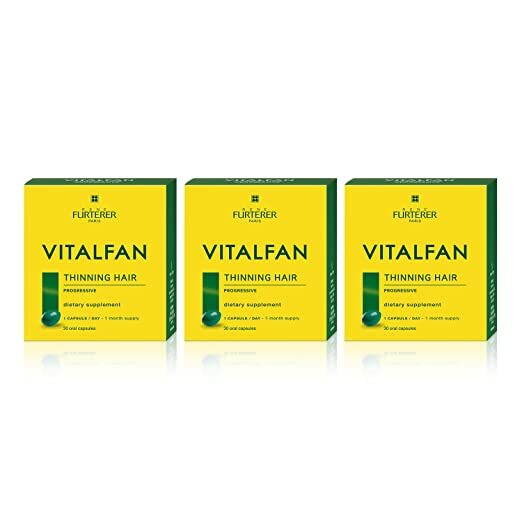 I hope this Rene Furterer Vitalfan Review 2018 has been a great source for your hair health. Rene Furterer Studies. A 3-month dermatological study of 90 subject with chronic hair loss, conducted at home. You provide al lot of good information here and it is presented well. I am glad that you found the information useful. All the best. Nice overview with handy resources provided. Thanks for your visit and glad you found the information useful. All the best. Thanks for this article Michelle. I found this very interesting and it sounds like something that would maybe be beneficial to myself. Thanks for your visit. I am glad that you found the information useful. Check back for my update in 3 months…I am just as curious as you are! Hi, Michelle. Thanks for the information. This sounds like a product that I will benefit from. I will definitely be back in three months to see what your conclusions are. Any natural product is preferable to manufactured drugs as I believe there will be no side effects. Thanks for your visit and your thoughts. Yes, I am psyched to see what happens in a few months. I am thinking good thoughts. And of course, natural is so much better than enhanced chemicals…we need to protect our bodies. Check back in a few months. And lemme know if you try it too. I have to say that I like your website it provides very useful information. I see how reading is so important I used to live in Brazil for almost 3 years, I know the Brazilian Ginseng Plant, I could not even imagine that this plant should be one the ingredients of Vitalfan. Worth reading. Thanks for your visit and your thoughts. I have visited Brazil and I love the culture and the people and of course, they have great hair…shiny and healthy. I am glad you like the website and more importantly, that you found the information useful. Visit any time. All the best. I am interested to hear how well this supplement works for you. I would love to have my hair thicker, as it is definitely thinning now. I like all the natural ingredients – lavender would probably double as a calming agent (which I assume would help with the stress related hair loss). Overall, I will keep an eye out for your review after you complete the 90 days. Thank you for sharing this information. Hello there, Andrea. Thanks for your visit and sharing your thoughts. Yes, please come back in a few months or even before and see how things worked out for me with this plan. I also love the ingredients too. Be in touch. It’s so great to see natural ingredients in products. This product has some real great oils, lavender being one I use for hair and skin care. Helps as a scalp treatment and along with the other ingredients, it makes this product one of the best on the market. Thanks for doing a review on this product. Thanks for your visit. Glad the article resonated with you. Yes, I love lavender too…it is such a versatile essential oil.